As beauty editors, we understand why people tend to err on the conservative side when it comes to their makeup—especially when a trend like no-makeup makeup is so big. But if the runways have showed us anything this year, it’s that now is the time to experiment with color, both in your wardrobe and in your beauty looks. And with all of our favorite lines releasing high-impact shades that pack a serious punch, it’s easier than ever to dip our brushes in. We identified four color families that keep popping up—pinks, purples, blues, and golden earthy tones—and gave them a spin using Marc Jacobs Beauty’s Eye-Conic Multi-Finish Eyeshadow Palette ($49). These all-new sets (six, to be exact) harness an updated pigment-rich formula, beautiful shades, and innovative finishes inspired by fabrics: satin (matte with a slight pearl), silk (pearl), lamé (high-shine metallic), and velvet (matte). Shades of scarlet have been trending for some time now, and the secret to nailing the look is layering. Using the Scandalust palette, mix Hot Pants (which has a pearl finish) with something more matte like Scandalous, and sweep the mixture up high toward the brow bone before carrying the color down along the lower lash line. Using an eyeliner brush and more Scandalous, brush a line on your upper eyelid from the inner corner of your eye to the outer, and add a wing tip. Do the same step on your lower lid, making sure it’s parallel to your first one, creating a double-winged effect. 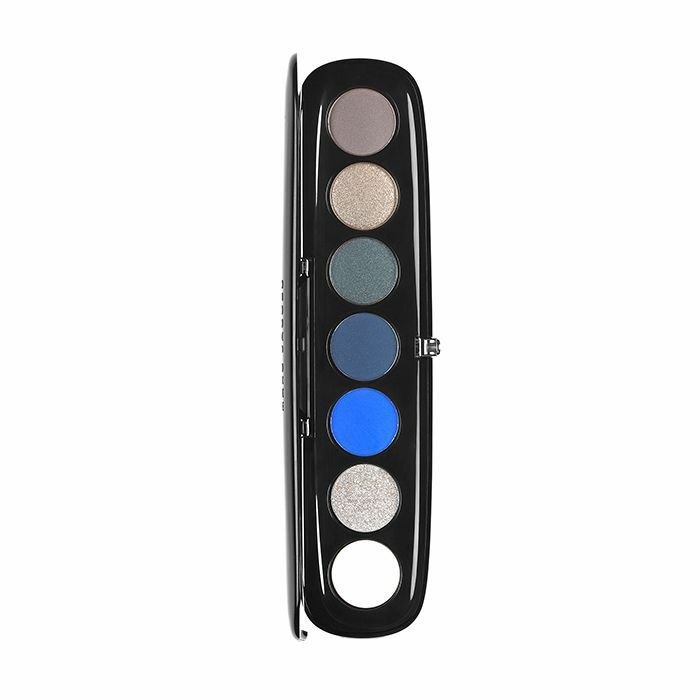 Toss your preconceived notions of blue eye shadow aside: It doesn’t have to look dated. Stick with a traditional smoky eye, but use shades of blue. Using the Smartorial palatte, pack the shade Power Platforms onto your lids, and add the high-shine metallic shade In Doubt to the inner corners of the eyes and brow bones. Pro tip: To accentuate the color and have it last even longer, apply Marc Jacobs Highliner Gel Crayon in Blacquer ($25) all over the lid before applying shadow. This season is all about metallics—particularly gold. Wash a generous amount of the metallic shade Pleather Python from the Edgitorial palette across your entire lid; then add Everywhere, a dark matte with a slight sheen, to the outer corners to add dimension. Make sure to blend it all out. Next, apply the Highliner Gel Crayon in Tabboo ($25) along the upper lash line and lower inner rim, extending the line out. Go back with a brush to blend it all into lashes, creating an undersmoke. Pull out the Frivoluxe palette, and start with a velvety-matte shade like Outrageously, blending it from your lashes to the crease. The key to the perfect smoky eye is blending—there shouldn’t be any harsh lines, so make sure you go through and lightly smudge and blend the shadow at the crease and along the bottom lashes. Next, mix the shades Fabulous and Dress together, both of which have a pearl finish, and sweep it across the upper and lower lash line to bring more light in. Complete the look by adding Highliner Gel Crayon in Plum(age) ($25) to the upper and lower lash line. Feeling inspired? Can’t get enough? 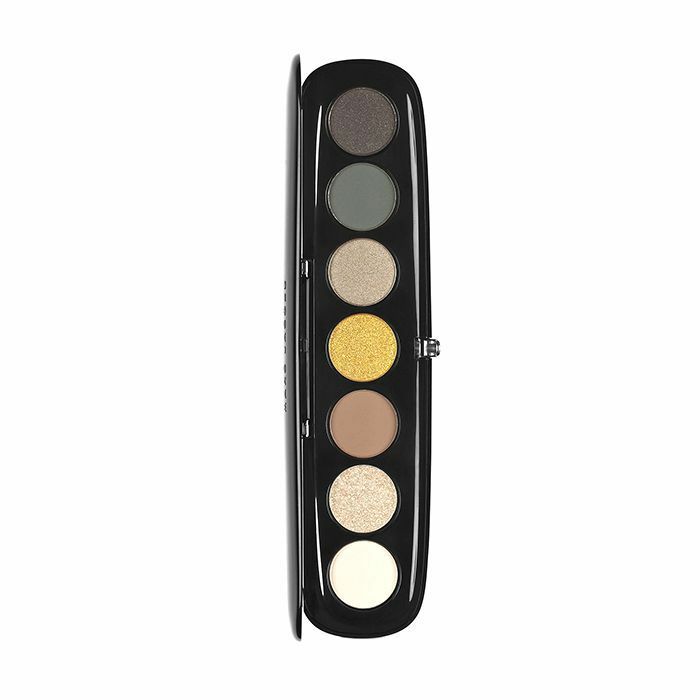 Wait until you see the rest of the Marc Jacobs Beauty Eye-Conic Multi-Finish Eyeshadow Palette collection. But consider yourselves warned: You’ll want to shop all six of them.